My local break is known for its long, peeling winter waves which, with the right conditions, can offer leg-burning rides down almost the entire length of the point (see photo below). That is, of course, only if three or four of your “closest friends” don’t drop in on you somewhere along the way. Like many California point breaks, the wave ends in a cove. 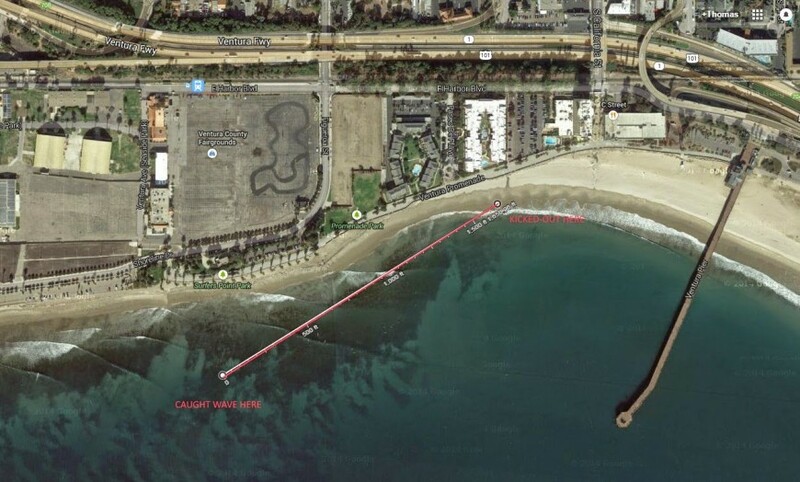 At my break, there is stairway access to the Cove beach, and the goal becomes one of riding a wave until you get “…all the way to the stairs.” The larger the swell, the further up the point you can take off and still make it to the stairs. Today was my turn. I was surfing my 7-3 Widget, with low expectations, jockeying between the shortboarders and the longboarders, and settling for leftovers. I caught a couple of fun ones, but nothing to write home about, you know, 2-3 turns and a close-out. Then a big set had everyone paddling for the horizon, myself included. After the 3-4 wave set passed, I found myself pretty much alone on the outside, lined-up with the public restroom and with lots of bobbing heads on the inside. Without much of a lull, a second set appeared, and at head-high, almost as large as the first. I paddled for the first wave, but missed…too far out. I let the second wave pass and was now in perfect position for the last wave. Three or four strokes, and I was up and riding. To my pleasant surprise, everyone else had either been washed in or had caught one of the previous waves. Looking down the line, I had no one in front of me for a hundred yards. I put the Widget through its paces, making long, carving turns, dodging paddlers and pumping through sections as necessary. While there was certainly no danger of me being mistaken for Kellly or Dane, I was surfing at my humble best, and enjoying every second. The Widget was flying down the wave, and it wasn’t until I entered the cove that I realized how far I had come. By then, the wave was down to chest-high, but still lined up. My plan was to pump all the way to the stairs, but the wave took me past the stairs before closing out. After wading in and walking back up the point, I decided to call it a day. Always better to leave the water on a high, I always say. Later, using Google maps, I calculated the distance traveled to be 1,650ft or over 500yds!! Here’s the board I was riding. The Widget Quad, 7’3″ 15-1/2″ x 22-3/4″ x 16″ 2-3/4″ 52L. Low rocker for speed, quad fins for hold and bump-wing tail for qucik turning. The full outline offers plenty of paddling speed and gets the board up and planing. If you’re ready to step-down from that longboard, don’t waste your time with an oversized “fish”. Get a Widget and watch your surfing performance progress to higher levels. The Widget is available form 7’0″ to 8’0″.